While mobile apps like Netflix or the Candy Crash Saga are everyone’s guilty pleasure, others offer a bit more than a pleasurable pastime. The App Store is currently teeming with productivity tools that tend to motivate, inspire, and drive changes to our everyday lives, professional and personal alike. And, to a busy businessmen, they are nothing less than a necessity. After all, what is the point of carrying around a pocket-size supercomputer if it can’t bring you a step closer to your business goals? All-in-one solutions like Bitrix24 are invaluable, but in case you still prefer using separate apps, our list will hopefully help you pick the best ones. 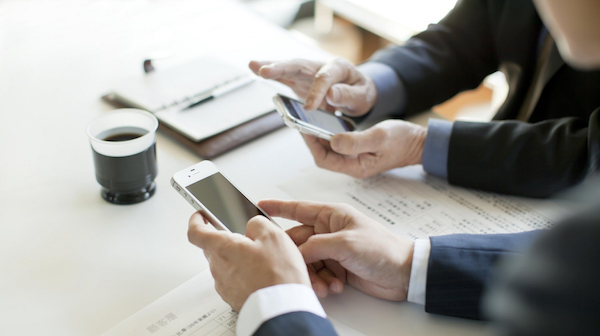 These are the 9 most useful iOS apps for aspiring businessmen, along with their alternatives. The greatest ideas come when you least expect them, so be prepared. If you download Evernote and keep it in your pocket at all times, you’ll be able to write them down, arrange them in a to-do list, share them with your teammates or dig them up during a brainstorming session. This is a simple app that lets you capture your thoughts in picture form as well, and access them from different devices. Evernote’s goal is to nurture inspiration, which is something that every visionary business leader needs. Alternatively, try Dragon. In case you don’t have time to pen down every little strike of ingenuity, this app will translate your voice memos into text. Though Evernote is convenient for creating to-do lists, this key feature is even better in task management apps like Todoist. Whatever it is you’ve assigned to yourself for the day, this classic go-to solution will make sure that you check it off. You can also break up your tasks into subtasks, color-code them for easier visualization and label them for seamless research. Just like Evernote, Todoist allows access across a wide range of devices. While we’re on the subject of time tracking, how many anti-procrastination methods have actually worked for you? The industry leaders have designed a myriad of variants during the last couple of years, but not a single one is more straightforward than Forest. It’s brilliant not because of some elaborate psychological trick, but because it appeals to your humane side. If there is a task that you need to finish, you open the app and plant a tree. But, if you open another app, the tree withers away. The concept is silly, but effective.You can try Streaks instead, but then you won’t get to watch a forest grow from your achievements. Closing a sales deal is an art known only to true masters. Now imagine if you finally succeed at converting your customer, only to find out that the contract has gone missing from the briefcase! That’s all done now, thanks to the digital age and clever apps like HelloSign. If your business is a part of the eSigning system, don’t miss a chance to make it richer for another client. This app allows you to scan the document, sign it wherever you are, edit if need be and send it back to the headquarters. Your customer will expect a professional-looking invoice once the deal is closed, so why not send it straight away? You can effortlessly do so with FreshBooks, a top-choice accounting app for small businesses. This cloud-based platform is a reliable choice when it comes to budget management as well, and comes with a practical time tracking feature and a reporting system. Not only will you spend less time on paperwork, but you’ll also get paid much faster than you used to. For personal bookkeeping with graphs and charts, try Spendee. How many big opportunities have you lost on the account of misplacing your newly acquired business cards? It’s a common problem in the bustling corporate world, but CamCard delivers an effective solution. By scanning your business cards, extracting available details and updating your address book, this app automates at least half of the contact management process. Regardless of how important they are, all your contacts will be translated to the digital form and stored on your phone for easy access. Keynote will not boost your productivity in the obvious way, but it will help you prepare the elevator pitch of your career. Designed with a simple interface that provides only the best tools, this presentation app is perfect for both last-minute preps and long-term collaborations. You can enrich your slides with attention-grabbing charts, photos, transitions and animations, so that each of them can stand out. With Keynote Live, you can invite all the big shots to witness your presentation in real time. In case you decide to use a different presentation platform, you’ll need plenty of storage space for maintaining it directly on the cloud. Dropbox excels in storing and sharing, and has been considered an essential business app for years. The possibility to send and receive large files on the go is its main advantage, even though Dropbox also enables your teammates to edit presentations, videos and texts from separate devices at the same time. Writing and editing in Dropbox is easy, but nowhere is functionality better than in Google Docs. It’s yet another standard app widely used by individuals, teams and organizations, and much of its popularity has to do with Google itself. If your business accounts are already a part of the Gmail platform, then look no further than Google Docs. All edits are automatically saved to the cloud, integrations with other Google systems are limitless, and daily operations that take place in the online world are streamlined and smooth. If you are looking for a complete suite of social collaboration, communication and management tools for your team, consider Bitrix24. Use promo code TIP10 when registering your free Bitrix24 account to get extra 10GB.